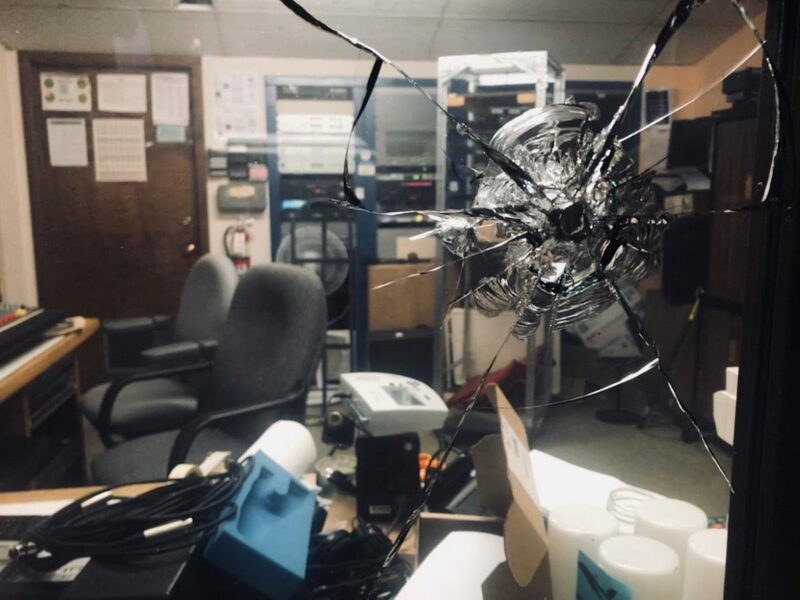 Bullets punctured a window in WORT's studios. A DJ was injured early Sunday morning after a masked man opened fire inside the studios of WORT in Madison, Wis. The DJ was released after being taken to the hospital, the station said in a statement about the incident. There were no other injuries. Police have not identified a motive for the shooting. No suspect is in custody, according to the station. The gunman shot at three volunteer hosts, WORT Board President David Devereaux-Weber told the Wisconsin State Journal. The hosts took cover in the station’s master control room and music library. A code is needed to get into the building, Devereaux-Weber told the paper. It’s not clear whether the gunman knew the code or held the door after someone entered the station. The gunman did not speak during the incident, he said. The station was off the air during a police investigation but signed back on Sunday morning. The station has changed the building’s keycodes, which are provided to evening and weekend DJs, according to Stentz. The station is also seeking bids from key card security systems that can log entry into the station but does not know “if they’ll be cost prohibitive,” she said. WORT is also working on replacing the glass in the studio that was damaged during the shooting. The station is holding a community meeting Tuesday night and will have crisis counselors available for station staff and volunteers, she said.